After the gritty heat of Chobe and Kasane, taking the boat to Impalila Island is a joy. 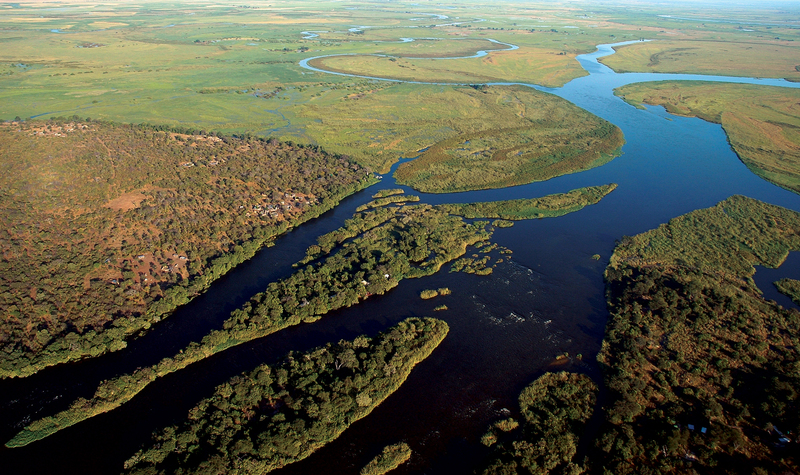 The island forms the north-eastern tip of Namibia at the meeting place of two major African rivers, the Chobe and Zambezi, and four countries, Namibia, Zambia, Zimbabwe and Botswana. B ird life abounds at Impalila. There are herons, cormorants, egrets, hornbills, marabous, ibises, spoonbills, cranes, and dozens of smaller birds you’ve probably never seen before, some flashing iridescent colour, all in rich abundance. 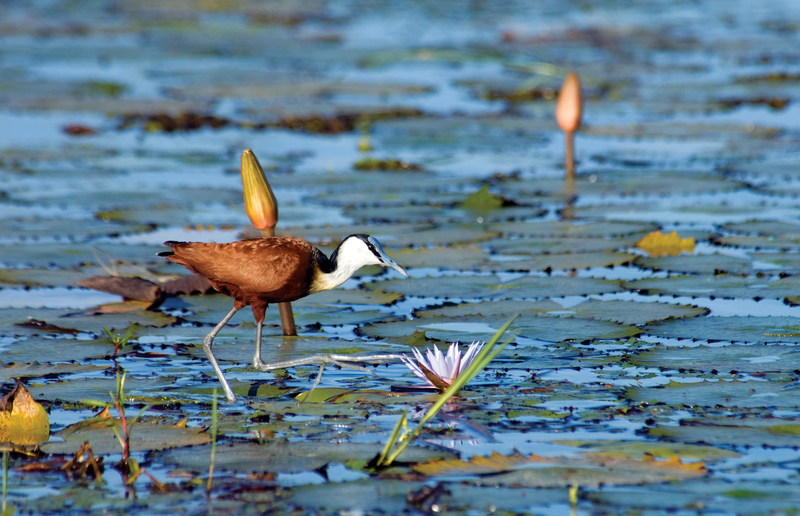 Jacanas stride amongst the gleaming blossoms of the water lilies, puddling each great red-lined dinnerplate leaf momentarily as they go. Inlets and bywaters are lazy with moored mokoro sleeping amongst the floating reedbed islets. Hippos yawn in couch-potato boredom at passing humans, rather as though disturbed by an advert break on television. There is too much vegetation here for many crocodiles to be visible, but look more closely at that outsized floating log. Crocodiles can always be seen upriver in the morning sun, basking in rows along the flat sandbanks, grinning and untrustworthy. Photo courtesy of Islands in Africa. Where the Impalila Island banks are higher and exposed, the soil is deep maroon, clutching boulders, nodules and flints deposited by the imminent convergence of two of Africa’s most majestic rivers. At the harbour there are abundant harvested bundles of reed and papyrus twice the height of a man, stacked against the trees to dry. Women exchange news and wait for boats, their chetenges adding a feast of colour. They load the golden mats they have made with their reed harvest onboard, the mats representing the skill and experience that brings a little extra income to the family. Many carry with them some of the morning’s catch, staple diet and added income, catfish, barbel, bream and the occasional tiger fish. There is a wheelbarrow parking place to which the women will return later in the day with their bargain sacks of mealies and perhaps a treat of Kasane supermarket bread for the children. The idyllic setting of Impalila Island in the Zambezi Wetlands Paradise is best enjoyed after the first rains, though you might like to take an umbrella in case the brilliant sunshine dulls to a quick rainstorm and those magnificent, high, disturbed skies actually manage some precipitation. If it rains properly it’s exciting and your umbrella quickly becomes redundant. A strong plastic bag for the camera or binoculars is more sensible. The first rains bring greens more vibrant than would be thought possible, a feast of complex light and texture that the camera cannot reproduce. The contrast with the red earth enhances the intensity. Heavy rain soaks away quickly through small sinkholes, leaving drifts of mopane pods which have danced in the downpour to the edges of temporary floodwater. For months their seeds have slept through the heat protected by a sticky wax, and now they burst into life, the ground, too, becoming densely green with their paired lobes of first leaves. Within days they are joined by a flamboyance of flowering bulbs, pink virginal lilies, delicate mauve spires, robust fleshy stems and flashes of yellow, all enjoying the opportunity of light and air before the tree canopy closes in. Extrovertly stylish beetles busy themselves everywhere, and scarlet velvet cushion spiders decorate the woodland floors. Swallowtail butterflies speed as fast as and bigger than some of the birds. Honey bees fly at the first glimmer of dawn and spend their long days foraging the flowering trees. This boulder-strewn band of the floodplains is inhospitable to elephants because it’s hard on feet too broad to avoid the stones. They do come sometimes during the dry season, when they have raided everywhere else within reasonable reach, and a swim across to the high stands of reed, papyrus and tall grasses appeases their hunger. On the whole, however, Impalila’s ground defence keeps it lush and free from their attentions, and only the handsome herds of oxen browse. 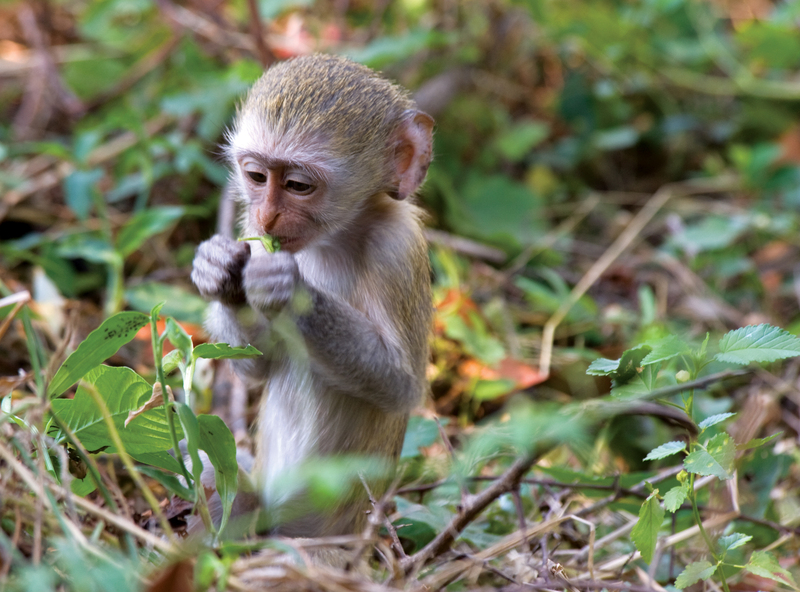 Vervet monkeys forage in troops, stone-turning for scorpion delicacies, rushing for the trees and peeping ostentatiously at the sight of anything unusual. Impalila has schools and a clinic and there are village shops, but there is no electricity, and water supplies are invariably fraught with difficulty. Years ago, large pits were scooped to use as rubbish landfill, but these now overflow, and it cannot be denied that, though most residents do try to address the issue, Impalila does have a cans-and-bottles disposal problem. There is some debate as to how many vehicles there are on the island. Between the three lodges there seem to be four and a tractor, and the police have one. All are used communally in one way or another and actual ownership isn’t easily determined. Whatever the situation, traffic is not a problem on the slow lanes of Impalila. The tiny planes bringing visitors to the dirt airstrip are even less of an intrusion. Everyone you pass has a warm greeting, especially since everyone knows everyone else, and you are therefore even more welcomed as an obvious visitor. Cultural village tours are new here. The Impalila Island Conservancy, led and run by the community, now market their way of life as a memorable experience, a biodiversity credit. Their business partner in Kasane does the booking and transfers. Guides are young local people and are professionally trained. Your journey on the river is exciting and safe. Passing through Border Posts is leisurely and free. Your guide will offer help when it is needed, information when it is useful and conversation when appropriate, and will remain unobtrusive when it is not. Village life and activities will be explained. So many languages are known and understood here that everyone is sensitive to the intricacies of communication, which add richness and laughter to the meetings of cultures. The young people will sing and dance their stories for you, flinging their beaded skirts and pounding the dust in the way you perhaps expected. The women’s display, sipelu, usually accompanied by just one man, may not be what you expected. It has echoes of generations of influences. Excitement builds, and, despite all your inhibitions, everyone will be delighted when the temptation to join in becomes irresistible. 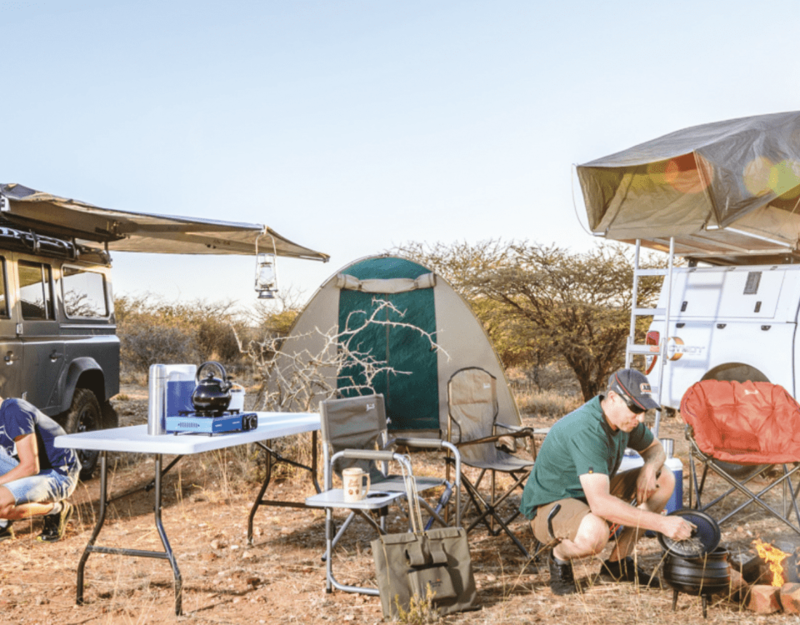 The Four Corners baobab is not to be missed. It is reputed that you can see four countries from its high branches and at ground level you can admire its structure and contemplate its place in the scheme of things.